Algae is a bad thing in your poor, but in the ocean they are the ultimate source of all organic matter that marine animals depend upon. sucking up climate-warming carbon dioxide from the atmosphere and sinking it to the bottom of the ocean. And for that, we can thank one other thing people dislike: viruses. Viruses infecting those algae are driving the life-and-death dynamics of the algae's blooms, even when all else stays essentially the same. According to results reported in Current Biology, a single North Atlantic algal bloom, about 30 kilometers in radius, converted 24,000 tons of carbon dioxide from the atmosphere into organic carbon - a process known as carbon fixation. The black rectangle delineates the area shown in Figures 1B and 2. (B) Map of surface chlorophyll from June 22, 2012 (day 174), emphasizing the phytoplankton patch as a distinct area of high chlorophyll concentration. Thick black lines mark the main attracting Lagrangian coherent structures from calculation of finite-size Lyapunov exponents. To facilitate the presentation, we plotted only the highest 20 percent of FSLEs (for the entire FSLE field, see Figure 2C). Thin black contour outline region of strong Chl gradient is used to define patch boundaries. Magenta diamonds mark the position of Argo floats used for extracting the mixed layer depth in the patch vicinity. Green diamonds mark the location of the sampling stations. Credit: Current Biology, Lehahn et al. Two-thirds of that carbon turned over within a week as that bloom grew at a very rapid rate and then quickly met its demise. A closer look at those algae revealed high levels of specific viruses infecting their cells. To put that in context, Assaf Vardi of the Weizmann Institute of Science in Israel says that this patch of ocean fixes about as much carbon as an equivalent patch of rainforest and then almost immediately turns much of it over. "This is, of course, only one patch out of numerous co-occurring patches in other parts of the Atlantic Ocean," adds Ilan Koren, also of the Weizmann Institute, not to mention those algal blooms that appear in other seasons and ecosystems. "While the impact that viruses have on the entire ecosystem was previously estimated to be very large, we provide the first approach to quantify their immense impact on open ocean blooms." Important questions remain about the ultimate fate of all that carbon taken in by algal blooms, the researchers say. Much of it is probably recycled back to the atmosphere by bacteria. But it's also possible that the virus-infected algae release sticky sugars and lipids, leading their cells and the carbon within them to sink faster to the ocean floor. (A) This image shows Chl cropped according to patch boundaries, which are identified as regions of strong gradients in the Chl field. Note the abrupt change in patch biomass as reflected in temporal variations in Chl values. For the equivalent images before cropping, see Figure S1. (B) Okubo-Weiss (OW) parameter emphasizing the core of the eddy in which the patch is embedded as a region in the velocity field dominated by vorticity (negative OW) rather than deformation (positive OW). (C) Attracting LCSs, which delineate transport barriers that separate between the patch and its surroundings. The images are from June 6, 2012, June 22, 2012, and July 2, 2012 (days 158, 174, and 184, respectively). Arrows represent the geostrophic surface currents. Purple dots mark the location of the patch centroid. Black contours delineate the patch boundaries. Green circles mark the 30 km disc around the patch centroid. Credit: Current Biology, Lehahn et al. "If the latter scenario is true, it will have a profound impact [on] the efficiency of carbon dioxide 'pumping' from the atmosphere to the deep ocean," Vardi says. "This carbon will then have a better chance [of being] buried in the ocean sediment." The findings will improve models that predict the future of algal blooms and their impact on climate. They also serve as a reminder that sometimes it really is the little things that matter. 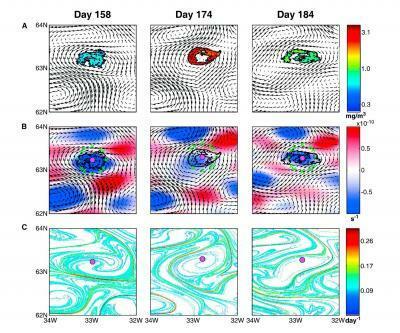 "These interactions begin when one virus infects one cell, but they end up causing the collapse of massive blooms that span thousands of kilometers," Koren says. "These life-and-death interactions on the micro scale have huge importance on the large scale and vice versa."